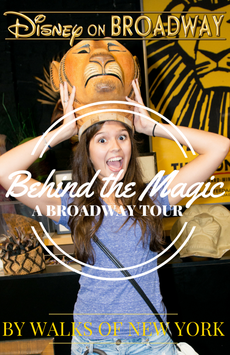 Go behind the magic of Disney on Broadway! Join our Broadway Insiders for a guided walking tour; then tour The New Amsterdam Theatre, visiting Disney's Prop Studio getting up-close and personal with original props, costumes, and set pieces that bring the world of Disney Theatrical to life. Please note: The tour begins at the George M. Cohan statue at West 46th Street between Broadway and 7th Avenue towards the end of the block, (NOT the statue in front of the red stairs.) The tour concludes at the New Amsterdam Theatre. On occasion tour may end within walking distance of the theater. The backstage area of Broadway theatres has been off limits to public tours for decades, and hasn't been accessed by the public in the New Amsterdam in nearly a century. We ask that you strictly respect your tour guide's instructions while backstage to continue to allow us to offer this highly exclusive experience. Between January 2017 and July of 2018, the costume and prop access will be restored via a mobile cart brought into the orchestra section of the theatre. Perfect for anyone with an interest in musical theatre, this Broadway tour takes you first on an ex-ploration of the history and characters of Broadway; visiting top sights like Shubert Alley, Sardi’s, Times Square and Roger & Hammerstein Row. Led by an expert Broadway Insider (actors, theatre managers etc. ), you’ll hear what goes into a real Broadway show before a special visit to the New Amsterdam Theatre. Here you’ll meet the in-house historian for a tour of the balcony areas, seeing the stage and - the highlight - a hands-on visit to the costume & prop studio!